Our bed and breakfast aims to make your holiday in the South Shropshire hills memorable. Wenlock has a king size double bed and looks towards Wenlock Edge. Clee has a king size double bed (which can be split to provide twin beds for children). Views are across the Corvedale to Brown Clee, the highest hill in Shropshire. Heath has twin single beds which can be combined to form a superking size double bed. Views are across the Corvedale to Heath Common where there is an interesting old chapel. Guests can relax in their bedrooms or in the hall lounge which has comfortable chairs. 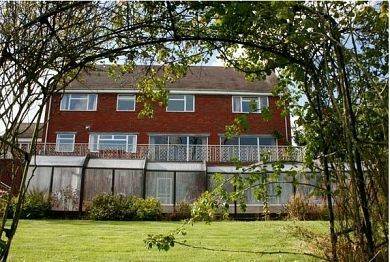 On sunny days guests can sit on the terrace or in the garden enjoying the views of the Clee hills. The covered swimming pool is available throughout the year. Breakfast is served in the dining room, or on the adjacent terrace when the sun shines, with panoramic views across the Corvedale. Our delicious breakfast is locally sourced and described on the food page. We provide full facilities for walkers and cyclists. A drying room is available for wet clothes, boots and equipment and a secure covered area is provided for bicycles.